Down Nicholson Street Mall, past the pho and noodle shops, Cheap n’ Chic is closing down. A FOR LEASE sign has been plastered across its windows. The walls, once crammed with goods, are now bared white. Only a few bags hang off the hooks. I browse while the Vietnamese community radio airs a saxophone’s mournful solo. People take their finds to the till. The woman behind the counter thanks them. She drops their money into a takeaway container. One by one, the coins smack against the plastic, ringing like gunshots. This is how things roll in Footscray. Immigrants staying at the old Maribyrnong Migrant Hotel have always been attracted to the region’s cheap housing and proximity to manufacturing industries, and the central business district gets a makeover with each migration wave. In the years after the Second World War, it belonged to the Europeans until refugees from Central and South America, the Middle East, and Southeast Asia took over. During my childhood and adolescence, Footscray was a Western-suburb frontier where people ‘speak no Engrish’, especially the Fresh-Off-the-Boat mums who dangled their half-naked toddlers over the gutter, the stench of piss overriding that of rotten apples. My parents took me with them on their shopping trips, introducing me to other Footscray idiosyncrasies: durian, eight-dollar haircuts, Made-in-Japan audiovisual fetishes, Forges, Chinese Chess, and frontyard karaoke. While Ma bought the essentials, Ba would babysit me. We’d window-shop at the books and records stores around Dennis Street: Lang Van, Khai Tri, and Nguyen Ha. Ba bought the latest Paris By Night, while I picked up gyrating dance moves from Lynda Trang Dai. For years, my parents continued their fortnightly ritual. In Little Saigon Market, amongst the stallholders crying out the six o’clock specials, and the thrifters sifting mountains for the glossiest fruits, they would close their eyes and attend to the sweet voices of Saigon mothers, ‘Hong gion, hong ngot, hong gion, hong ngot.’ Persimmons, crunchy, sweet, crunchy, sweet. Or the harsher cries of Hanoi students as they freshened up greenery never seen inside a Woolworths store. During such transition periods, Footscray is at its most diverse. Hopkins Street is a mishmash of the past and present. T. Cavallero and Sons’ pasticceria continues to sell cannoli next to the Vietnamese pho shops. A few doors down, Awash Ethiopian Restaurant offers wat with injera. Over time, ailing businesses like Cheap n’ Chic will make way for halal butchers, yoghurt houses, and Pakistani grocers, while Footscray continues to serve as the new immigrant’s town. But a different kind of wave threatens to wash away this cultural ecosystem. According to the 2009 Footscray Strategic Report, more and more skilled workers, students, and university-qualified residents are settling in the area. Average household incomes are on the rise and so are real estate prices. On a grocery run, I spot a new development shadowing Little Saigon Market—a concrete monolith on the corner where the Chinese chess-players used to meet. And next to the Italian solicitors, the Ethiopian cafes, and the Vietnamese electrical repair shops, the Barkly Theatre is being converted into sixty luxury apartments. The artist’s renderings of the restored theatre haunt me on the train ride home. In the foreground of one, a couple is inspecting their new foyer: the man might have been lifted from a Mills and Boon cover; the woman is blonde and pretty. No Nguyens, Patels, or Pastores within sight. The Strategic Report describes it as the ‘gradual gentrification of Footscray’, and the State Government and Maribyrnong City Council are encouraging the change, allocating $52.1 million towards its renewal as part of the 2030 Transit Cities Program. Upgrades for Nicholson Street Mall and a new pedestrian bridge at Footscray Station are nearly complete. The new bridge dominates the skyline. In its space-ship curves and its glass and Swiss-cheese sheeted-metal, there’s promise of blue skies and safer streets. If the Government and private investors have their way, Footscray will assimilate and become the new Fitzroy, Richmond, Northcote: ethnic on the outside and white underneath. Months later, my partner and I meet up with friends at Napier Street’s revamped Station Hotel. Clothed in uniform black, the waitresses look much like the nonnas who once patronised the market down the road. On questioning, they speak with authority, demystifing menu items such as parfait, Terrine de Campagne and Chateaubriand. There are bottles of red beside Crown Lagers. Designer wallpaper. The gilt-framed blackboard specials are written in English rather than Vietnamese. Our friends like the steaks here, which are done by The Botanical’s executive chef Sean Donovan. ‘It’s not Footscray,’ my partner declares. I want to tell him that it is, since it sits opposite the Town Hall. But I know what he means. A wonderful piece showing the Asian point of view on the gentrification of Footscray. As a white man myself, I must say that Footscray still seems very Asian to me; I feel like the odd man out when I go there. I think people have been talking about Footscray becoming the next St. Kilda, Carlton, Brunswick, etc. for ages now. Honestly, I haven’t seen much of a change. It doesn’t seem to be getting even remotely close to becoming a trendy hipster inner-city ‘burb. There are no cafes serving lattes, no European restaurants. Bars and pubs are closing down and getting converted into apartments. Footscray isn’t even close to resembling St. Kilda or Carlton; I can’t see yuppies doing ‘Barkly laps’ in their Ferraris anytime soon. While some things have changed, I believe Footscray’s heart has remained the same. It is still very much an Asian stronghold, and it lacks the catalyst to undergo a gentrification like the one seen in Yarraville. House prices will continue to rise, just like everywhere else in Melbourne, but I’m skeptical of claims that wealthy white people will force the Asians out of Footscray anytime soon, as there really is nothing in Footscray that would appeal to that demographic (it may be trendy for yuppies to go to a Vietnamese restaurant once in a while, but not every day). 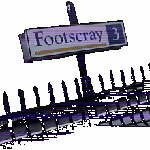 In face, the only thing Footscray has in common with the aforementioned suburbs is its proximity to Melbourne’s CBD. Thanks for the comment. I am not a Footscray local, and I certainly do not visit Footscray as often as my parents do, but there’s a definite move from a Vietnamese-centric business district to something more multicultural. There’s also a shift from the dog-eat-dog business district (may the best pho win) to a more socially aware community with the arts centre, Lentil As Anything, and Grassroots Grocery. It’s not Chapel Street, but it’s still a gentrification of sorts, or at least it feels like such in my second-generation-Vietnamese mind. Eek. What I meant was ‘a more socially aware community with the arts centre, Lentil As Anything, and Grassroots Grocery becoming a part of the scene’. Yup. Think this site is really great. I was born in Footscray, went to school here, still live here and I’m in my 20s. Everywhere inner-city will become more gentrified over time, but I actually think Footscray has fared pretty well considering how Yarraville and Seddon have turned out. I understand the fears of Footscray becoming gentrified & loosing it’s cultural heritage. But I also can’t help but feel irritated when the tag is applied by those who don’t live here. Someone I met recently asked if I’d moved here Footscray because it was becoming gentrified. Because a white person with an education couldn’t possibly have been BORN in the suburb! Most white people i know living here are either a) living below the poverty line or b)were born & raised here. Sorry for not getting back to you sooner. I’ve been hibernating. While I was aware that Grasslands (not ‘Grassroots’, my bad) has been around since the 90s, your comment has made me realise that Footscray isn’t the only thing that has changed; my definition for ‘gentrification’ has also morphed over the years. As a teenager, I saw well-maintained Victorian mansions with English gardens and luxury European cars parked in bluestone driveways as being gentrified. Even now, there’s very little of that in Footscray. Right now, I see gentrification in organic grocers, inner city boutiques that support local designers, and hybrid cars. It’s the luxury of ethics, i.e., having the money to buy the more expensive, organically grown pears as opposed to a box of bruised apples at the end of market day. Footscray has had Grasslands and a strong community arts centre for ages, but it’s only in the last few years that such initiatives have been embraced by not just the radical left but also the mainstream middle classes. This plus luxury boutique apartments screams gentrification. Being mainstream middle class, born and bred in the gentrified suburb of Camberwell*, with a sudden itch to settle in Footscray, I should know. *I’m not white, but that’s a mere technicality.